Nothing says summer like fresh blackberry pie. 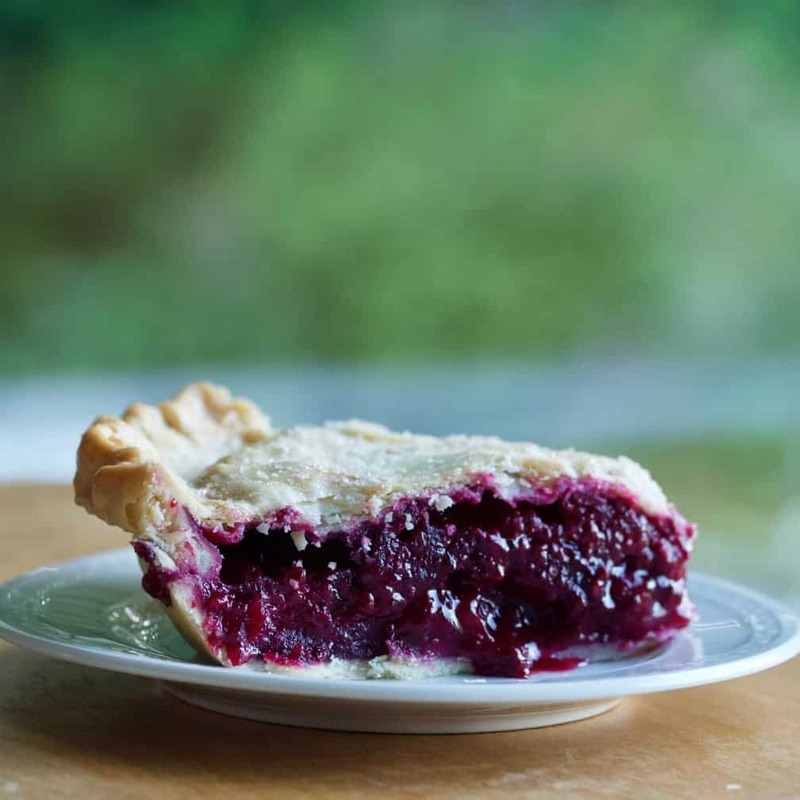 Here’s a delicious Blackberry Pie with a coconut oil crust recipe your whole family will enjoy. This pie filling stays in the pie and on your fork! I use coconut oil in this pie crust. Coconut oil makes a truly lovely, flavorful, flaky crust. Go get some blackberries and make this pie and crust. You will love it! Summertime means lots of fresh blackberries at out. Blackberries do EXCEPTIONALLY well on our property. Over the more than 30 years we have lived here we have engaged in an unending battle with these prolific brambles to keep them at bay. Our driveway lane, barn, flower beds and back fields are constantly reseeding themselves with these thorny beastly vines. Birds and bees love them! Harvesting the vines is very difficult unless you have a handy path way (we mostly harvest the ones we can access easily on our driveway). Blackberry vines are made with excellent defenses. Those thorny, sharp pointy spikes come off easily into skin, clothes and shoes, even going through shoe bottoms! Blackberries Painfully remind us they don’t give up their fruits easily. And…they grow really, really fast! Blackberries can cover a large lot in no time at all. If we don’t tend the fields, in a timely manner, the berries just take over. And fences? Forget keeping them clear of this bramble fruit. Think hedgerows! Blackberries on the vine ready for harvest and blackberry pie. Ouch! look at those thorns! Along the way we have developed our own methods of harvesting blackberries without too many battle scars. Nimble fingers and tough shoes bottoms! Also just take a few scratches and thorns in stride. Consider them battle scars worth the spoils. OR plant THORNLESS blackberries. We never will here but we envy you if you can! Local fruits stands and farmers markets probably sell fresh blackberries if you don’t want to ruin your clothes. Didn’t I mention they stain? NOW FOR THE LOVE…Blackberries are a super fruit containing a HUGE amount of nutrients, anti-oxidants and Vitamin C.
Go here to discover all the great nutritional and health benefits of this fruit. We love to eat them. They taste delicious fresh off the vine and in all sorts of yummy treats, try my blackberry coconut oil crumble bars! The vines produce fruit for weeks. Every year we pick and freeze a bunch of blackberries for winter Blackberry cobblers, pie (like this recipe), Ice cream, Blackberry Smoothie and blackberry crisps. And for all the trouble to manage and harvest blackberries… this delicious, healthy bramble fruit is certainly worth a few stickers! Consider it a challenge! This Blackberry pie recipe is nice and easy. The filling is not too sweet or runny. We love it! This pie has the best pie crust ever! This coconut oil crust is flaky, delicious and SO easy to work with. 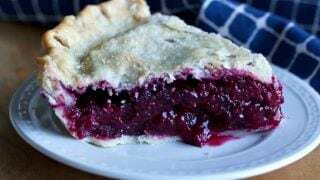 I have incorporated the crust recipe into this blackberry pie recipe for your convenience. HEAVENLY. That’s it. It’s really really good, very easy to make and for many people the very BEST part of whatever pie I attach it too. NOT kidding! It’s a beautiful flaky crust. Highly recommend it and the recipe is incorporated right into your recipe card. Also…This pie is NOT prone to over browning. However, if you check the pie after the first ten minutes and find the crust browning, pie crust shields can be made from tinfoil by crimping sections of tinfoil around the outer edge of the pie while baking. 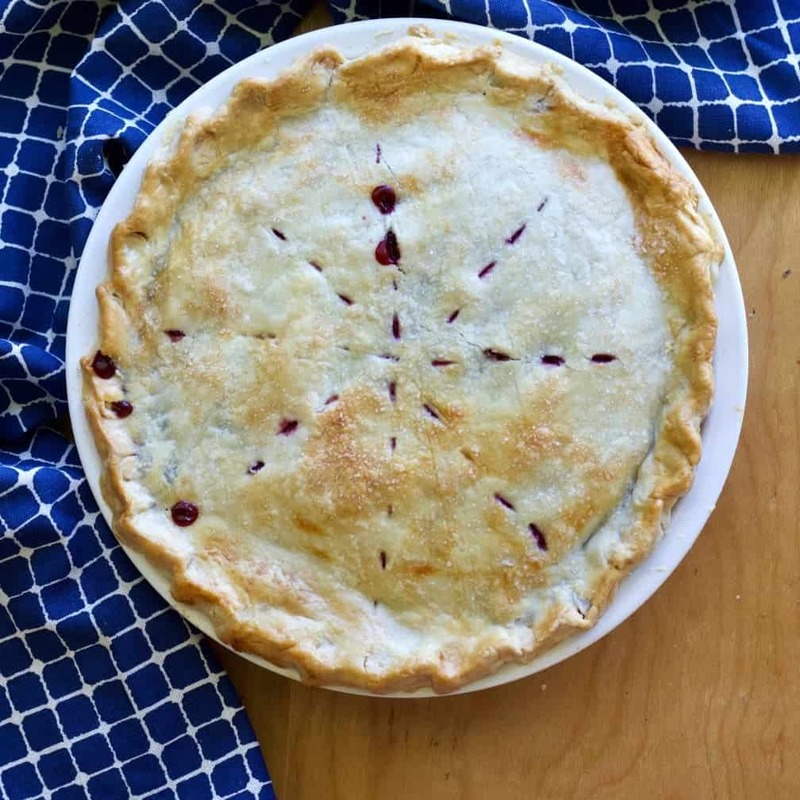 a Delicious Blackberry pie with a flavorful flaky coconut oil crust the whole family will enjoy. 6 teaspoons butter cut into pieces. Wash the fresh blackberries and pick out stems and debris. Drain them and let them dry. Set aside. Whisk together the 3 cups of flour and salt. Add the melted coconut oil and stir until pea sized crumbles form. Add 3 Tablespoons water and mix into the flour mixture. Add more water until a dough forms that clears the sides of your bowl and forms into two equal sized dough balls that hold together. Roll one dough ball between two parchment sheets until large enough to form a circle about two inches larger than your 9 inch pie plate. Peel off the top parchment paper. Invert the rolled dough into your pie plate and peel off the second parchment paper. Gently arrange the pie dough in the bottom plate. Trim the dough to 1/2 Inch overhang past the pie plate. Combine your drained and dried blackberries with 1/2 Cup sugar and 1/2 Cup flour. Spoon the mixture onto your dough lined pie plate. Drop 6 butter pats over the blackberry filling. Set aside. Roll out the second pie dough ball as described for the first dough ball. Gently invert the rolled pie top over the blackberry filling and arrange it so an even amount of dough overhangs the bottom crust. Crimp the dough together with a fork or flute the pie edge as shown. Pierce the pie top with a knife in any pattern you desire. Whisk the egg white with 1 tsp. water. Brush over the pie top. 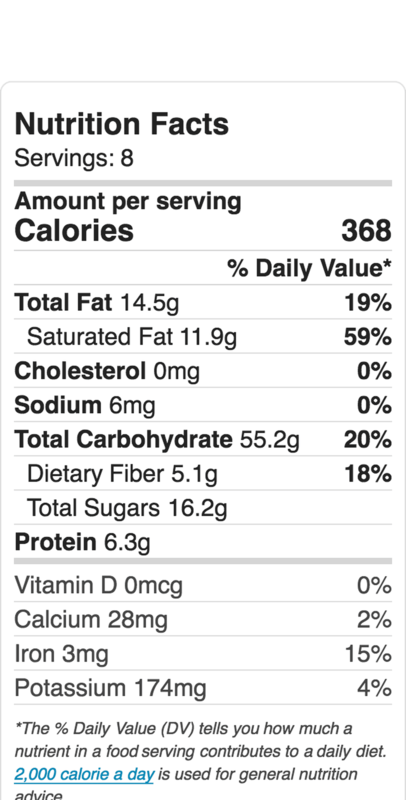 Sprinkle the tablespoon of sugar lightly over the egg washed pie top. Bake 10 minutes at 425 °F. REDUCE heat to 350 °F and bake 25 minutes. Pie is done when the filling bubbles out of the piercings in pie top and the crust is golden brown. Cool completely before serving to ensure the filling is set up. This pie crust is NOT prone to over browning. However, if you check the pie after the first ten minutes and find the crust browning, pie crust shields can be made from tinfoil by crimping sections of tinfoil around the outer edge of the pie while baking. Find the crust recipe here: coconut oil pie crust.